Have you ever wondered what muscles do you use for walking? Here are some answers. 3 What About Abdominal Muscles? 4 What Joints Do We Use When Walking? The glutes propel your leg forward. As you step forward, your tibialis and flexor digitorum longus flex your foot upwards. The back leg engages your gastrocnemius and soleus in the lower leg, and the biceps femoris, semitendinosus and semimembranosus muscles in the upper leg. 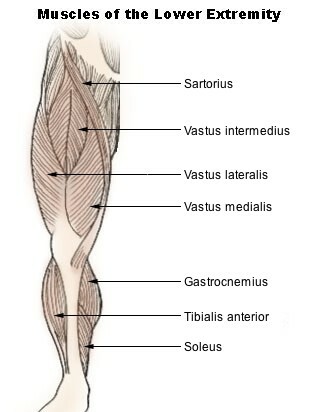 The iliopsoas, rectus femoris and sartorius muscles are responsible for flexing the leg. The gluteus maximus, semimembranous, semitendinosus and biceps femoris are responsible for extending the leg. The gluteus medius, gluteus minimus and the deep gluteals are responsible for abducting (moving towards the centre) the leg. The adductors longus, brevis and magnus, pectineus and gracillis are responsible for adducting (moving away from the centre) the leg. The biceps femoris, gluteus maximus, gluteus minimus, semitendinosus and semimembranosus and the deep gluteals are responsible for rotating the leg. Each time you take a step, you need to lift one foot off the floor while balancing your body weight onto your other foot. Your hips tilt sideways while bending your knee and you land on your heel propelling your body forward. You then straighten the forward leg while the back leg prepares to bend. While we engage our core muscles in our abdomen to keep our spine straight, abs don’t really get a workout unless we intentionally contract them. What Joints Do We Use When Walking? Knee joint – composed of the femur, patella, tibia and fibula; meniscus, anterior and posterior cruciate ligament; extensor and flexor muscles. Ankle joint – formed of the femur, tibia, tibula, malleolus, talus; ligaments. In a meditation workshop I attended, all participants were asked to really focus on the mechanics of walking and turning their attention on each movement that makes it possible to take a step. I found this exercise to be particularly useful when walking. What we take for granted is actually a complex dynamic of synergistic movements. Biomechanically, dozens of muscles engage at the same time to move the body forward. As far as the thought processes are concerned, we walk “on autopilot” so we use our autonomous nervous system to give the right commands to our muscles.